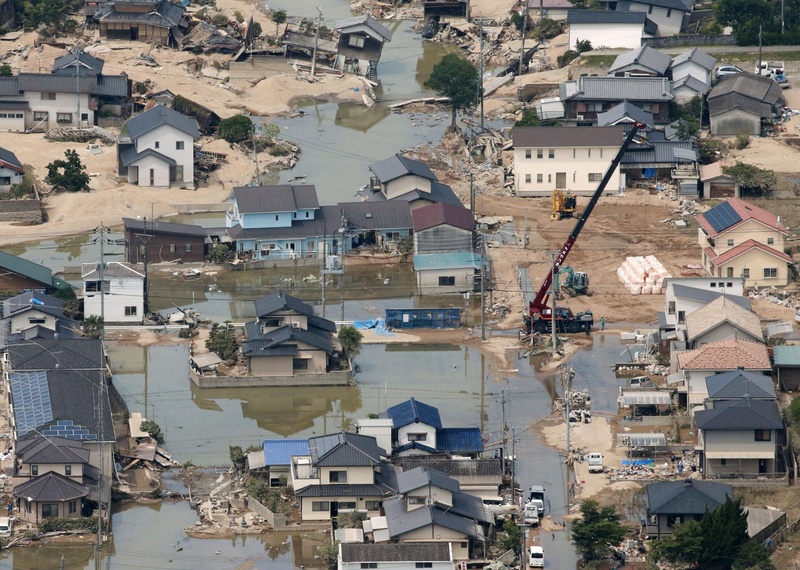 OKAYAMA - The danger of flooding in the Mabicho district of Kurashiki, Okayama Prefecture, had been well acknowledged before it was submerged in floodwaters after torrential rains hit the area over the weekend. 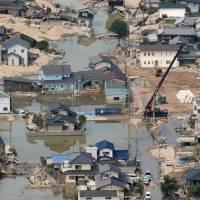 Dozens of people have been confirmed dead in the district, which suffered severe flooding in the storms that lashed western Japan. Nearly 30 percent, or about 1,200 hectares, of Mabicho was swamped, affecting about 4,600 houses, after the embankment of the Oda River burst 3.4 km upstream from the point where the river merges into the larger Takahashi River. Shiro Maeno, an Okayama University professor of river engineering, pointed out that the embankment probably collapsed due to the so-called backwater phenomenon, a process in which a rise in the water level spreads from downstream to upstream. According to the land ministry’s Chugoku Regional Development Bureau, the Oda River’s water level tends to become higher around the merging point because of a slower stream and the existence of a curved section. The ministry had planned to begin work to expand the width of the Oda River this autumn and move full-steam ahead with it in fiscal 2019. It had also planned to later begin a project to lower the river’s water level by moving the merging point 4.6 km down the stream. Maeno said the flood disaster might have been reduced if the project had been completed earlier.